I have been waiting to try out a product that I purchased and received last week. I had heard so much about WEN by Chaz Dean that I was literally antsy when around my Wen bottle. I found myself pumping a small amount out and rubbing it on the ends of my hair just to get get a feel for the product. So what is Wen? Wen is not a shampoo, rather it is a cleansing conditioner. You will not find sulfates or other harmful ingredients in this thick cleansing conditioner. I heard that this product was great and your hair would feel wonderful, blah blah blah. Isn't that what we hear about every product? Everything is wonderful about a hair product until you try it on your own head and end up looking a mess. Well I wanted to put Wen ( I purchased fig) to the test to see if my hair would be shiny, bouncy, soft and all of the other things promised by Chaz Dean. I followed the instructions carefully and I rolled my hair and went to bed. This morning I took the rollers out, looked in the mirror and this was playing in my head " When I first saw you I said Oh my I said Oh my , you're my dream." ( anyone who saw Dreamgirls can appreciate that song- when Jamie fox was signing to Beyonce). OK Im back on track, basically what I am trying to say is that my hair looks amazing and it feels like silk....real SILK. I did get a touch up last week but man oh man is my hair GORGEOUS (yes I am tooting my own horn). This product will replace your shampoo, conditioner, detangler, deep conditioner, and leave in treatment. After washing Wen out of your hair you will take about 3 pumps and leave it on your hair then continue your normal hair routine. I must say since my hair didn't look too shiny while it was wet, I added coconut oil but the feeling alone is worth purchasing this product over and over again. Wen is broken down into two collections, thick/course or fine/medium. 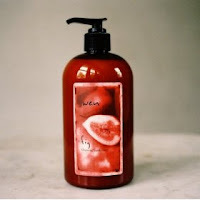 You can get this product in fig, sweet almond mint, lavendar or several other variations of this cleansing conditioner. When you recieve Wen you will also get a little booklet from Chaz Dean detaling the hair problem specifically addressed by each Wen formula. Please note that this product will not lather because it does not include the detergents normally found in shampoos. While taking a shower one day I looked at my body wash and found some of the same ingredients that are in my shampoo...the horror. This product is now a staple in my hair care regimen. Please let me know what you think of Wen if you have used it. Sounds like this is a winner for you! Does your hair feel cleansed? Did it feel weird to wash your hair with product that didn't lather up? Yes this product is a winner in my book. The lack of lather did not bother me becuase I have used other shampoos that will not lather, like a shampoo from Carols Daughter ( I will review that poo soon) so that wasn't a big deal for me. Yes my hair felt really clean. Thats the whole concept of this product- you don't need shampoo. When you receive Wen you will also get some reading material on the line and the benefits of the product. One thing that was mentioned is that the water and rubbing of your figners loosens the dirt, which is why you are instructed to saturate your hair with water first. Also you have to allow the water to run over your hair for a few minutes then you introduce the product to your hair. My sis and I are contemplating on whether we'd like to purchase this product. Is it possible to purchase the cleanser on its own? Absolutely! There are things in Chaz's kit that I thought I would have no use for so I purchased just the cleanser from Amazon. (I also wanted to just get one items because I was not sure if I would like it.) There are other places online where you can buy just the cleanser..like QVC...or ebay. Now if I remember correctly, you are like me when it comes to wanting something to smell good. Fig is not horrible but its not very sweet either..its ok. However the fig scent is gone because my new favorite hair moisturizer overpowered the fig scent. Check the blog for my latest post. Don't be scared, I think you will enjoy Wen. But since you are scared you may just want to try one bottle which you can get through Amazon.com $28.00. If you buy from Chaz Dean's site I think you will have to get the kit, and since this is your first time you may not want to make this investment (even though it may be worth it because for $1.95 dollar extra you get his whole kit $29.95). My hair is very dry also so I know where you are coming from. Wen just gets better and better with continued use. Now in terms of this product lasting, Chaz recommends like 30 pumps should be used to wash your hair then you can repeat,so think about 60 pumps of this product. I wash my hair every 3 days but in recent weeks I have been doing it once a week. Since you have short hair you may be able to cover your hair while using fewer pumps of the product. Also remember I use it to wash my hair, as a deep conditioner, as a leave in, detangler, moisturizer..lol so I use this product often. I would love to know what other products you are using to moisturize your hair. If you want to you can email me at product_junkie_queen@yahoo.com and we can discuss some products. Hi Anonymous, I ahvent used when in a long time but it certainly was a good line. Im glad you like it too! I don't even eat beef !!!!!! Radiant skin in a bottle! I wanted to love it. Now I see the light!